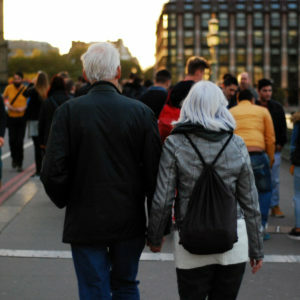 Retirement offers couples opportunities and also challenges as they navigate the end of working life. It has become increasingly recognised as a complex period of potential and possibility, rather than a fixed stage. Research has found that retirement has moved away from being a simple transition of full-time work to full-time leisure and increasingly consists of different kinds of activities, which may include part-time work, volunteering, community activity and longer periods of leisure. It is important to recognise that a transition into this phase may also include feelings of loss on different levels, for example, the loss of identity associated with a career or the loss of an established social network in the workplace. For some people retirement will be a very positive experience but for others it could be less positive, depending on the circumstances that surround it, for example retirement because of redundancy, ill health or needing to care for an elderly or sick family member. A person’s experience will also depend on how well they adjust to change and how well they are able to deal with the psychological challenges this life change will bring. What is 50+ Couple MOT? It is a brief early couple intervention designed to develop the natural resources and capacities your relationship to enable you to face the changes that can arise as you approach retirement. The intervention aims to provide space in which you can learn how to give your relationship a regular tune-up and therefore, ways in which you can strengthen your relationship and use it as a resource during this transition. There will be an initial session where you will meet a therapist and you will talk about how you see your future together. If by the end of this first session, you decide that the intervention will be useful, you will have 3 follow-up sessions and DVD material for you to view in between sessions. Couples who are aged 50+ and are approaching retirement or couples where one partner has recently retired and you would like to think about the process together. Marriage Care is currently offering this service in a number of centres around the country: London (Finsbury Park), Portsmouth and Swindon. We also have plans of rolling it out in the north of England in the next few months. If you think this service could be right for you or would like to find out more, please get in touch with our Appointments Team today on 0800 389 3801.